Reviewing two Call of Duty games in one year? What is the world coming to? I see Advanced Warfare as CoD’s sluggish response to a gaming world that’s starting to leave it behind. CoD 4 was an incredible success that moved the series out of its increasingly-tired WW2 setting and set the FPS trend for the next half-decade, and five years ago you couldn’t throw a rock without hitting a Modern Warfare imitator. Today, though, things look very different. Even this second incarnation of CoD is getting long in the tooth; Modern Warfare-era shooters have become just as overexposed as WW2 was a decade ago, and CoD is facing challengers to its crown (Titanfall in particular) that are innovating in ways CoD simply cannot if it remains resolutely entrenched in the modern world. And these newer games are good enough — and successful enough — that for this shooter with a hundred ripoffs, this FPS that used to dictate the direction of the entire genre, the message is finally becoming clear: adapt or die. 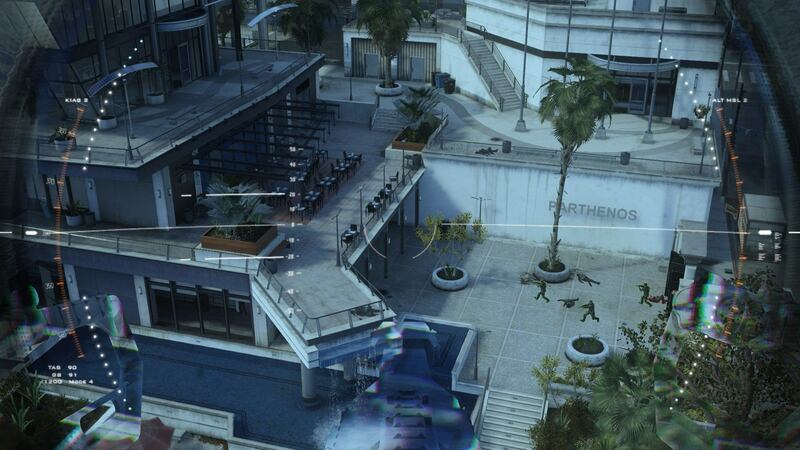 Advanced Warfare is CoD’s first real attempt to adapt. It’s no longer set in the modern world, or even a weird parallel version of the modern world as the misfiring Ghosts was; instead, Advanced Warfare shifts the action half a century into the future, where drones are as common as bullets and every soldier is clad in a strength-enhancing exosuit1 that gives them increased mobility and a variety special abilities. This in turn gives new series developers Sledgehammer an awful lot of latitude to tinker with the formula, and also to insert a digitised Kevin Spacey into the game as the not-at-all evil head of an international megacorporation with its own private army. Both of these measures provide Advanced Warfare with a much-needed shot in the arm; I dip out of the CoD series on and off, and Advanced Warfare is the best iteration I’ve played since Modern Warfare. Unfortunately at the end of the day it is, however, still CoD. And in today’s gaming landscape, and with all prejudice put aside, I’m genuinely starting to believe this is something of a problem for the series — no matter how much stuff they bolt onto the top of it, it still feels like the same game they’ve been releasing for the last seven years. Maybe that was the idea; for some people I’m sure this is a distinct plus point, and trying to shift the inertia of a gargantuan franchise in the space of one installment was always going to be tricky in any case. As it stands, though, this attempt to reinvent itself doesn’t go anywhere near far enough. Let’s get down to what’s actually changed. The single player campaign (because that’s all I buy these games for) sets you as some guy whose name I keep having to look up… Mitchell? That sounds about right. Mitchell kicks off the game by taking part in a Marine assault on North Korea, who have apparently been investing heavily in ziplines and drones in the forty-five years separating this game and the present day — at least judging from the number of drones and ziplining soldiers you blow out of the sky. This opening mission introduces you to some of the more basic changes to the game; you get a double jump from your exosuit, and grenades are now “smart” grenades, which hover for a moment after you throw them and then home in on a target underneath your crosshairs. Which was a nice idea, except this makes them worse than regular grenades because a) they’re no longer travelling on a parabolic arc and you can’t lob them behind cover and b) you have to keep your crosshairs trained on the target for a second in order to get it to go where you want it to, which means you might as well just shoot them instead. Anyway, at the end of this first mission Mitchell gets crippled in combat, which leads to his being offered a job at the Atlas corporation by Kevin Spacey. Atlas appears to be Serco/G4S2 if Serco/G4S were even larger than they currently are and also had a huge and technologically-advanced standing army, which is where Mitchell finds his employment combating an anti-technology terrorist cell called… god, I’m really terrible with names this week. That’s a pretty damning indictment of the plot of Advanced Warfare, really. 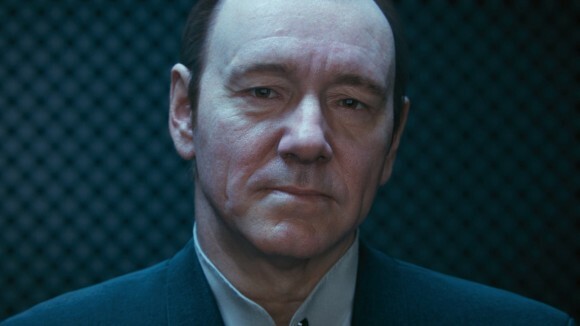 It is entirely nonsensical and forgettable, and only the sterling efforts of Kevin Spacey and the guy playing Gideon prevent it from being what Ghosts’ plot was: a thinly-veiled excuse for the player character to flit around the world like it’s an over-large theme park visiting all of these heavily scripted experiences the designers have put together. At least they are good scripted experiences. Possibly this shouldn’t be surprising given that CoD is the master of scripted gameplay, but Sledgehammer take the opportunity to put the player in some pretty interesting locations and situations. Advanced Warfare has you dashing through a Greek town evading fire from a sniper armed with a railgun, creeping through the undergrowth hidden by thermoptic camo, covering a special-ops team with fire from a stealthed-up drone — it’s nothing we haven’t seen before, but I will say there is a definite perception difference between dodging regular bullets fired from a sniper rifle and dodging railgun blasts that are punching through solid cover next to you. Most of the exosuit abilities are either highly situational or else rationed so stingily that they have little impact, but occasionally you get thrown something like the grappling gun attachment that fundamentally changes the way you approach the game — the grapple is even used in a pretty respectable stealth level where you infiltrate a villa complex whilst doing your best Scorpion-from-Mortal-Kombat impression by grappling hapless guards into the undergrowth to be murdered. Some of the stealth levels reminded me of the SAS levels from Modern Warfare, which is just about the highest compliment I can pay a CoD title, while the open warfare you sometimes get dumped into is just as impressive; I particularly liked the shootout in Antarctica that turned into what was essentially the Battle of Hoth, complete with enemy walkers. 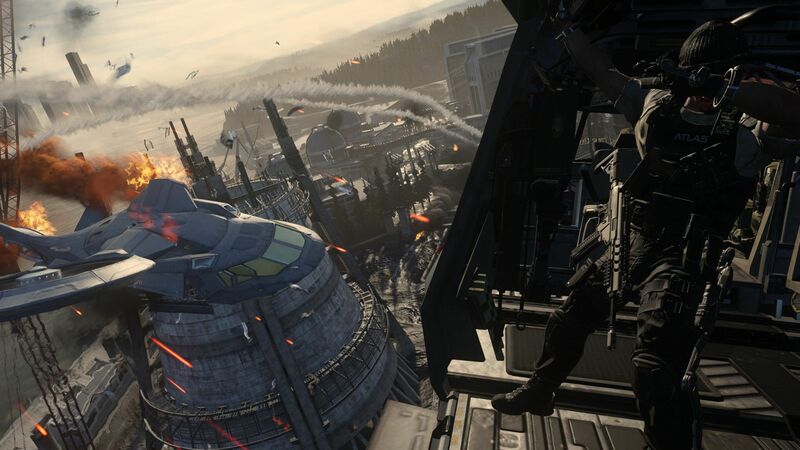 It comes partly from the setting and partly from some well-tuned encounter design, but Advanced Warfare’s high points are pretty damn high – for CoD, anyway. Even the regular shooting segments have enough quality about them that I didn’t resent them all that much. There’s a slight problem in that all of the guns are now future guns and so don’t have the instant recognisability of an AK-47 — not to mention there being very few guns that do cool future stuff, most of them fire bullets just like today’s guns which is decidedly dull — but the gunplay itself is well-judged and satisfying. There’s also the added pizzazz of a second variety of multifunctional utility grenade, which has different modes you can switch to depending on the situation – EMP for taking out drones, flashbang for flashing and banging, and a threat mode that paints any enemy in the blast radius in see-through-walls vision — and which I found myself using far more than the normal type of grenade. Otherwise it’s the usual business of shooting a bunch of guys with their heads poking out of cover. I have some big issues with the way CoD does this because the enemies are perfectly content to sit where they are taking potshots at you like something out of the Naked Gun, making no attempt to flank or anything, and it’s been like this ever since the series started. Halo nailed pseudo-intelligent baddies all the way back in 2001; hell, Half Life managed to convince the player they were through some simple voice cues in 1998. 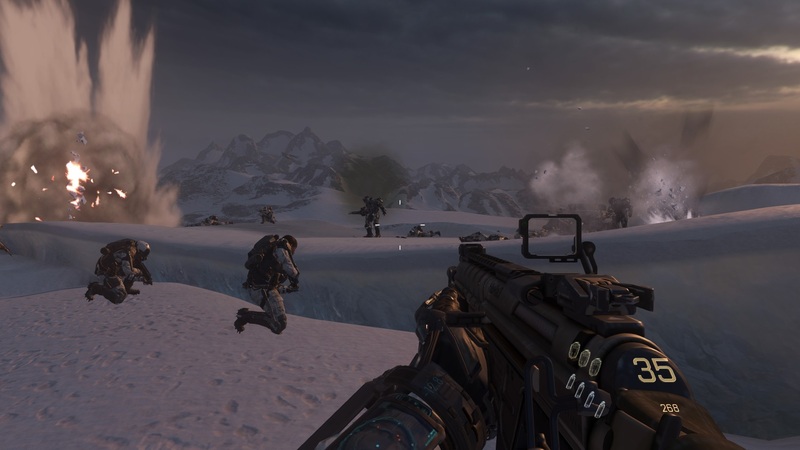 Sixteen years later I can only assume the passive enemy AI in CoD is a deliberate design choice and that the inescapable feeling that these things are just shooting galleries is intentional. It’s one of the reasons I say Advanced Warfare still feels like a CoD game underneath all the future gumpf, because ultimately you can point to a typical gunfight in Modern Warfare and compare it to a typical gunfight in this game, and threat grenades aside they’ll be like-for-like copies. That’s not a huge problem since Modern Warfare was a fine game, but with the change of setting I was hoping for something more. As for Kevin Spacey, I’m sure his character also had a name but he’s pretty blatantly been hired for the purposes of hamming things up as villainous Kevin Spacey. I’m always surprised when stunt casting like this works, but he actually seems to be enjoying himself and doesn’t phone in his performance like certain other A-list actors moonlighting in videogames I could mention, while the high-quality CGI sequences bookending each mission allow him to deliver the trademark Spacey Smirk far more effectively than he could in-game. He genuinely adds quite a lot to Advanced Warfare. Unfortunately he lasts a disappointingly short time before lapsing from moral ambiguity into full-on mwa-ha-ha supervillainism, which I felt was something of a waste of his talents. It was also symptomatic of what I shall refer to as the Doctor Who problem, where it’s not possible to have measured, proportionate stakes in our fiction any more; instead we go straight to “Kevin Spacey is trying to conquer the world” and I laugh both him and Advanced Warfare out of the room3. I can’t close out this review without mentioning Advanced Warfare’s performance issues. Simply put, it’s one of the worst PC ports I’ve played in recent years thank to the way it handles changing the video options. First, it defaults to video options so low that it looks like you’re playing something from the first generation Xbox. Attempt to change them to something more appropriate — I went for High, there’s no other game I’ve run into where I’ve had difficulties running stuff on High — and you’ll discover that no matter how minor the change Advanced Warfare will insist upon reloading the entire damn level. Inexplicably and unforgivably for a game made in 2014 and which is loading from an SSD, this takes three minutes. Three minutes. Three minutes of waiting every time you try to change the graphics options, which for me turned out to be very often since running it on anything higher than Medium turned out to produce framerate stutter that rendered the whole thing unplayable. The weird thing was that this wasn’t an immediate problem; it would only rear its head after 30-odd minutes of gameplay, which is the sort of thing that points to a memory leak somewhere. These are not the production values I expect out of what is still arguably the pre-eminent franchise in videogaming, and for which Activision are asking an eye-watering £40. I wouldn’t call Advanced Warfare a great game. Thanks to the efforts of Sledgehammer I’d be fairly comfortable calling it a competent one; to their credit Advanced Warfare certainly feels like a fresher, more energetic game that has — for the most part — benefited from all of the future tech that’s been crowbarred into the game. The thing is, though, it’s also still very obviously a Call of Duty title. Despite the conscious attempt to disconnect itself from what had gone before, ultimately Advanced Warfare doesn’t even try to cut that umbilical cord and strike out in a new direction, perhaps out of fear of alienating what has turned out to be an absurdly rabid, if shrinking, fanbase. As a result Advanced Warfare doesn’t have anywhere near the same visceral impact of Modern Warfare or the original CoD; compared to these titles it doesn’t do anywhere near enough to break new ground. Since that was the point in this whole exercise I’d have to call it something of a failure — which is not necessarily a mark of shame for Sledgehammer as reversing CoD’s decline was always going to be a difficult job. Instead, Advanced Warfare acts more as a facelift for the series than it does a trip to the Fountain of Youth; it’s an entry that briefly manages to stave off the more obvious effects of aging, but underneath the surface it’s the same old game. If you really like shooters it might be worth picking up when it goes on sale (or what passes for sale for CoD games, anyway); just don’t expect it to be anything really different, because it’s not. It’s CoD. For some people that’ll be reason enough. For me, not so much. Surprised you’ve liked the game. Not that I’ve played any CoD since CoD4 (and I hadn’t completed any since CoD2) but everyone rights about it like it’s inevitably popular garbage like Transformers movies or something. Do I understand correctly Kevin Spacey being evil is an unironic plot twist? Is this the era of stagnant boring shooters and blooming strategy games market? Do you think there is something wrong with you cause you didn’t like Endless Legend and liked Advanced Warfare? I’ve skipped Modern Warfare 3 and the Black Ops games, but while it is trendy amongst some circles to hate on whatever the console masses are consuming, CoD’s bad rap is mostly self-inflicted. 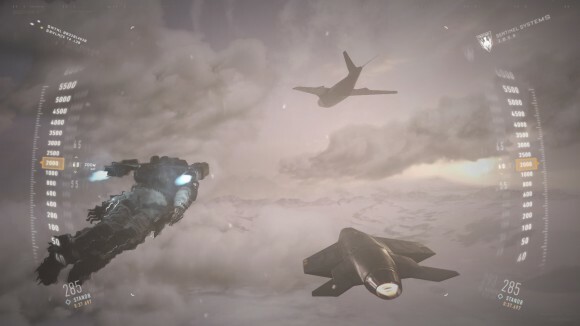 While it might have arrived at them by accident, Modern Warfare made several potent observations about the modern battlefield that were flipped on their head and turned into an adolescent power fantasy in its sequels. They became the gaming equivalent of the cinematic blockbusters they tried so hard to ape, in that you had a moderate amount of fun while playing them and then *instantly* forgot about them the moment you turned them off. And for the last seven years it’s showed little ambition past this; the series has been content to wallow in its own mediocrity for so long that even the sluggish effort that Advanced Warfare makes to change itself is welcome. Also yes Kevin Spacey being evil is unironically supposed to be a plot twist. And thank God for that, nothing could be more played out at this point than friggin’ Call of Duty. Also, I got a bad feeling devs are about to get very slack when it comes to the PC versions of next gen games, it’s enough to make me consider “jumping ship” and just playing next gen games on my PS4.